Bhai Baldeep Singh of the Anād Foundation dug into the depths of Punjab to map a profound balladeer, and we, his team, had the privilege to accompany him on this mission. One of the finest exponents of the Balladeer tradition, Dhadhi Des Raj Lachkani has shown his musical prowess in mastering instruments like the Toombi and Sarangi from an early age. He has taught under NZCC’s Guru-Shishya Parampara in the past years, and has been training his sons, grandsons and other disciples in the traditional Dhadhi kala, the art of Indian Balladeering, as Bhai Baldeep Singh calls it. On the pleasant afternoon of Saturday, June 13, 2015, we reached village Lachkani in Patiala District, Punjab, to document Dhadhi Des Raj Lachkani. Our welcome by the musical Maestro, with joined hands and a bowed head was a fine display of his humility and simplicity. Meeting us at the entry to the pind, he led us to his memory beholden ancestral house built on a little mound towards the South-West of the village. The house was a typical rural setting, with a courtyard surrounded by rooms, and a shed for cattle and their fodder. Cots and manjian, traditional jute woven beds, riddled the courtyard, seating other family members who welcomed us into their home. After a brief discussion over refreshments and BBS’s insistence upon hearing him sing over the sound of the Sarangi, we set out for the village temple. The temple was a lonely structure at the centre of a huge open space, accompanied only by the Banyan tree to the left of its entrance. An old metal nagara, traditional war-drums which are also played during celebrations, lying next to the front door of the temple grabbed BBS’s attention. Upon his request, Dhadhi Des Raj played the nagara, the round backed pair of drums, when stricken, called several locals to the yard to bear witness to this event. Des Raj Lachkani’s ancestors had been playing this percussion instrument for their Jajman’s, village patrons, in the temple for several years. He played fascinating 4-beat patterns and traditional tihais which he picked up from watching his father play. Upon being asked whether he had any formal training in the art of playing the nagara, he mentioned that he just learnt by watching his father. He then capped it all by playing the unique Mirza beat pattern on the drum. After the stint with the Naghara, he began tuning his Sarangi. After a splendid rendition on the nagara, he awakened the strings with his bow. His fingers and the bow intermingled with the strings, breaking the silence of the yard with resonant music. The beautiful sound of the Sarangi, was coupled with the bells on the end of the bow, concocting a divine symphony. 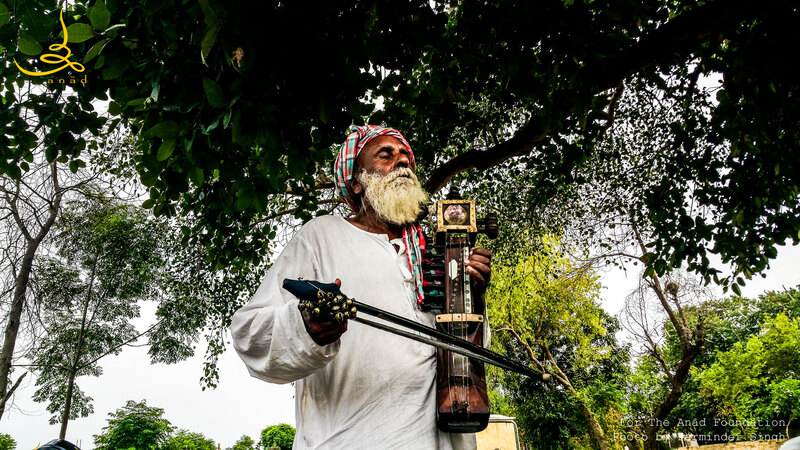 Engrossed in his own art, Des Raj ji played the music of his ancestors and sang of the lores of Bhagat Puran and Mirza, serenading the locals and us alike. The performance happened under the Banyan tree, with everyone seated around him, as he rotated with high spirits and closed eyes, belting out poems like Heer by Waris Shah in musical compositions. He sang three compositions for us, and enchanted the evening sky. We left the place with his music echoing in our hearts. A student who loves to read books that uncover the hows and whys of politics, religion and cultures. Generally a chirpy, friendly and outgoing person, I'm a hopeless traveler and shutter-bug. Easy to spot with my trademark turban, a mark of my faith and pride. Hailing from Bathinda, Punjab, my love for all things Punjabi sometimes manages to surpass even my love for doughnuts, to which I swore my allegiance long ago.